Paediatric histopathology primarily receives placentas but does not receive pregnancy remains below 15 weeks 6 days gestation. 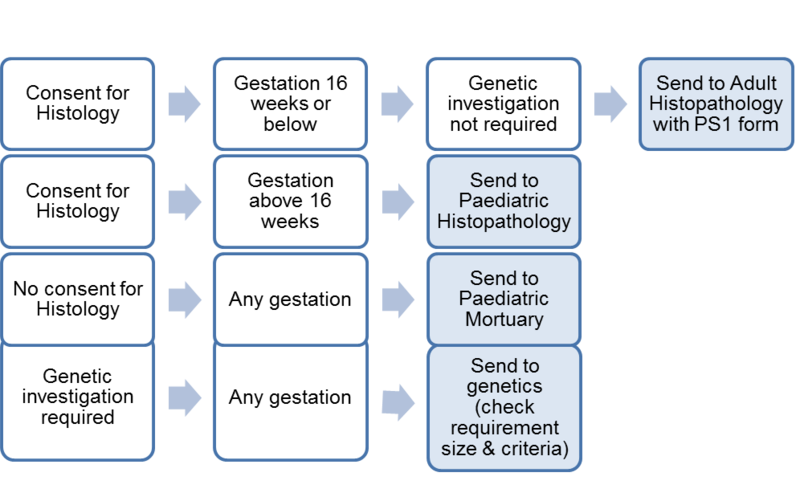 The flow chart below summarises which departments should receive placentas/pregnancy remains according to their gestation and consent status. Requests for Post Mortems (PM) following pregnancy loss over 12 weeks gestation should be sent to Paediatric Mortuary with consent and clinical history. It is best practise to fix the placenta including all the length of cord that is not taken for genetics examination* and membranes in 10% formalin as soon as possible to prevent autolysis. The pot should be sufficiently large enough to allow fixation and optimum histological examination, about 10 to 12 inches in diameter and larger than the diameter of the placenta. Always complete a ‘Request Form for Histological Examination of Placenta’. These can be obtained from Paediatric Histology if required. Please note, all samples MUST be delivered directly to Paediatric Histopathology not to a transport drop off point and double check you have correctly labelled the sample with the patient’s details and included a request form.